Non-slip for large tile and stone wall applications.Non-slip for large tile and stone wall applications. A reliable, general purpose mortar for basic installations over plywood, cementitious surfaces and other substrates. Meets ANSI A118.4 and A118.11 shear bond specifications. 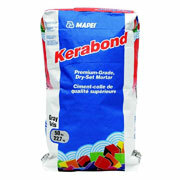 Acceptable for bonding porcelain and ceramic tile. Ultraflex LFT is a premium, nonsag medium-bed and thin-set mortar for large-format and heavy tile and stone for interior/exterior floor, wall and countertop installations. 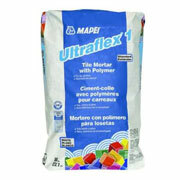 This mortar has a high content of unique dry polymer, resulting in excellent adhesion to the substrate and tile. It is formulated with Easy Glide Technology™ for ease of application. Ultraflex 2 is a professional-grade, single-component, high-performance, polymer-modified thin-set mortar for interior and exterior installations of ceramic, porcelain and dimensional natural-stone tile. 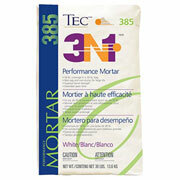 This mortar has a high content of unique dry polymer, resulting in excellent adhesion to the substrate and tile. Ultraflex 2 meets or exceeds ANSI A118.4 and ANSI A118.11 requirements when mixed with water. 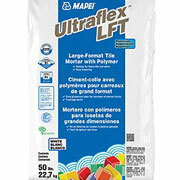 Ultraflex 2 can be used for interior and exterior installations of tile in most residential floor and wall applications. In commercial applications, use on interior floor and wall installations and exterior floors. NEW! 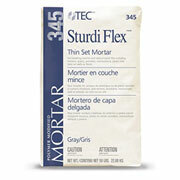 TEC® PermaFlex® 300 LHT Mortar is a one-component, Portland cement based tile mortar designed to set large format ceramic and stone tile firmly in place, without lippage or shrinkage, for interior and exterior floor applications over concrete where the embedded thickness is between 3⁄32"-1⁄2" (2.4 mm-12mm). 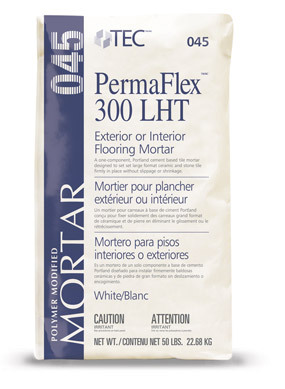 PermaFlex® 300 LHT Mortar may be used for the installation of procelain tile, ceramic tile, quarry tile, non-moisture sensitive natural stone*, cement tile, pavers, and high bottom lugged tile. * All natural stone should be tested to be sure discoloration does not occur. Mapelastic is a cementitious membrane that waterproofs concrete and masonry. It also offers protection against chemical attack from de-icing salts, sulfates, and carbon dioxide. 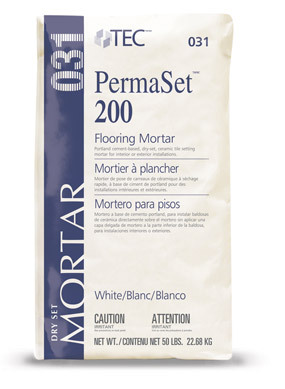 Large-Format Floor Tile Mortar is a polymer-enriched (“modified”), large-and-heavy-floor-tile mortar (formerly “medium-bed mortar”) and thin-set mortar for floor applications of large-format tile. It is used to install ceramic tile, porcelain tile, quarry tile, Saltillo tile and natural-stone tile. 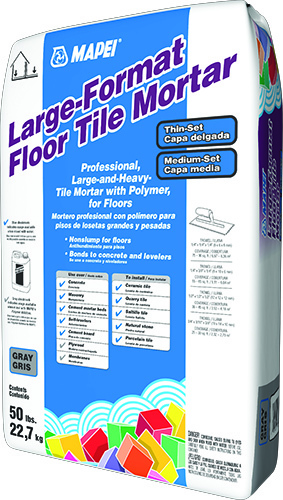 Large-Format Floor Tile Mortar is designed to give better support under large-format tile.